The importance of ensuring your products and instruments are clean and sterile every time they come into contact with a patient or end user cannot be overstated. The burden of responsibility falls on the manufacturers of finished medical devices to provide clear, understandable and reproducible cleaning and sterilization protocols that have been validated to be effective. 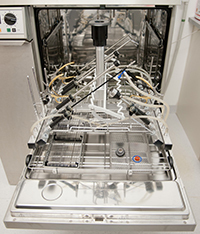 With more than 30 years of experience in this field, Eurofins Medical Device Testing offers a broad range of microbiological, bio-/chemical and toxicological testing to examine products for the intended reprocessing procedures according to ISO 17664 to validate procedures for manual and automatic cleaning, disinfection and sterilization. * For the evaluation of the cleaning procedures one parameter is sufficient in Europe. For the registration by the FDA, two parameters have to be examined. Click a link below to download one of our Reprocessing Validation resources.